For more than fifty years, the United States supported the Colombian military in a war that cost over 200,000 lives. During a single period of heightened U.S. assistance known as Plan Colombia, the Colombian military killed more than 5,000 civilians. In Plan Colombia John Lindsay-Poland narrates a 2005 massacre in the San José de Apartadó Peace Community and the subsequent investigation, official cover-up, and the international community's response. He examines how the multibillion dollar U.S. military aid and official indifference contributed to the Colombian military's atrocities. Drawing on his human rights activism and interviews with military officers, community members, and human rights defenders, Lindsay-Poland describes grassroots initiatives in Colombia and the United States that resisted militarized policy and created alternatives to war. Yet, despite the civilian death toll and documented atrocities, Washington considered Plan Colombia's counterinsurgency campaign to be so successful that it became the dominant blueprint for U.S. military intervention around the world. Emperors in the Jungle: The Hidden History of the U.S. in Panama (Duke, 2003) is an exposé of key episodes in the military involvement of the United States in Panama. Investigative journalism at its best, this book reveals how U.S. ideas about taming tropical jungles and people, combined with commercial and military objectives, shaped more than a century of intervention and environmental engineering in a small, strategically located nation. 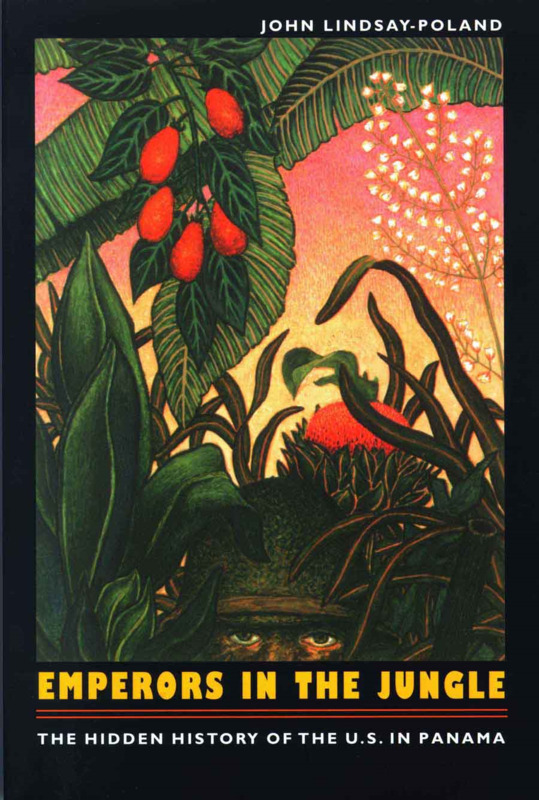 Inside Panama (with Tom Barry, Interhemispheric Resource Center, 1996). Purchase book. Con Carlos Pérez Ricart, “Derechos Humanos y Exportación Legal de Armas: Estados Unidos y Alemania frente a la crisis mexicana,” Foro Internacional, marzo de 2019. “Making Visible the Weapons of Empire,” NACLA Report on the Americas, January 4, 2019. “Bullet Points: The Gun Problem We Share with Mexico“ Western Friend (pp. 24-26), January/February 2019. “Mexico's gun violence a "moral crisis of complicity" for U.S. border states,” (with Gabriel Schivone, Arizona Star, December 17, 2018. "How U.S. Guns Sold to Mexico End Up with Security Forces Accused of Crime and Human Rights Abuses," The Intercept, April 28, 2018. "America's Guns: Made in the US, killing in Mexico," Al Jazeera, March 28, 2018. "Berkeley Police Association PR campaign distorts evidence," Berkeleyside, January 9, 2018. "Las Vegas, SWAT Teams, and the Cult of the Gun," Huffington Post, October 17, 2017. "A Federal Program that SF Needs to Cut," 48 Hills, February 6, 2017. "'Good Guy' Narratives and Community Safety," Huffington Post, September 13, 2016. "The Movement to Stop the Militarization of Police," Street Spirit, October 2015. "Supplying the World's Third Most Deadly War," Huffington Post, September 24, 2015. "Removing Military Weaponry from Our Streets," Huffington Post, August 6, 2015. "The US Shouldn't Export Colombia's Drug War 'Success,'" Insight Crime, July 9, 2015. "On Washington's Watch," Huffington Post, July 1, 2015. "The Mexican Military's Buying Binge," NACLA Report on the Americas, March 23, 2015. "Central America: Police and private investment don’t replace political will and compassion," Forum on the Arms Trade, March 11, 2015. "Don't Feed the Beast: Applying Human Rights Standards to Federal Police Grants," Huffington Post, February 10, 2015. "Considering the Panama Invasion, 25 Years Later," Telesur, December 20, 2014. "Theater and Substance at the School of the Americas," November 2014. "'Guerrillas Killed in Combat' and the Colombian Military's Persistent Impunity," NACLA Report on the Americas, Summer 2014. "A Response to the Drug War," presentation to Marin Interfaith Task Force on the Americas, September 2013. "Will Common Sense Ever Prevail? Lost Lessons, Militarization and Cycles of Violence and Impunity in Colombia and Mexico," with Marcela Vásquez, Revista de Estudos Universitarios, 2013. See also my blog archive at Fellowship of Reconciliation's site. "Soft-Pedaling American Intervention," Peace Review, vol. 8, no. 2, 1996. Gross Human Rights Violations: The Legal and Illegal Gun Trade to Mexico, Stop U.S. Arms to Mexico and the Mexican Commission for the Defense and Promotion of Human Rights, 2018. The Rise and Fall of "False Positive" Killings in Colombia and the Role of U.S. Military Assistance, 2000-2010, Fellowship of Reconciliation and Coordinación Colombia-Europa-Estados Unidos, 2014. Military Assistance and Human Rights: Colombia, U.S. Responsibility, and Global Implications, Fellowship of Reconciliation and U.S. Office on Colombia, 2010.